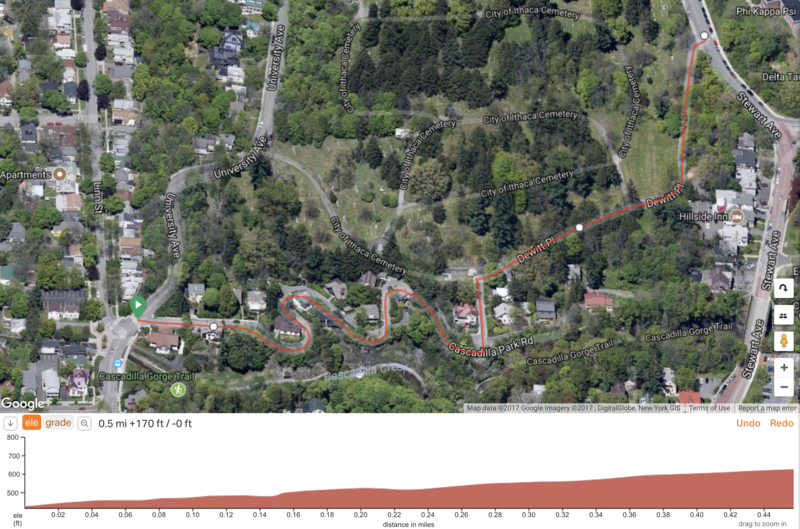 The Cascadilla Hillclimb has been a season-end event since the early '80s, taking advantage of Ithaca's classiest climb, a small switchback street along the edge of Cascadilla Gorge, winding its way among old houses and gardens and finishing .6 miles later in a cemetery! The format is double elimination match racing in which riders in each category are paired up, and compete up the climb. Like a tennis tournament (or the NCAA basketball format), winners progress to the next round while losers drop to a lower bracket. When you've lost twice, you can focus on the free food and drink, but until that time you will continue to be paired up with others in your category and climb the hill again...and again. To win overall you may have to climb the hill as many as seven times! Categories and matchups are based on the abilities and characteristics of who shows up, and are very creative, and challenge matches are encouraged among friends and strangers, often with creative conditions. Participants may or may not be serious racers. We create categories for all who want to join in, including tandems, kids, commuter types, political rivals—you name it. We guarantee you will meet new people and have fun.